Fourteen students from Plymouth University have signed up for a competition designed to improve their marketing skills and enhance their employability. The Michael Spiers Business Project is a collaboration between the South West jewellery retailer and the Futures Entrepreneurship Centre, and is open to any students currently enrolled at the University. First held in 2014, the participants in this year’s competition – which includes six individuals and four teams – have been asked to undertake competitor research into comparable, high-end accessory retailers who have embraced e-commerce and digital marketing. They must produce a practical marketing strategy, detailing their findings and recommendations on issues including social media, banner advertising and affiliate marketing, by the end of April. The top three will then be asked to present their reports to the company’s directors and media agency, with the winner being announced at a champagne reception in May. The competition was launched during an event at the retailer’s Plymouth showroom, and participants will be hoping to emulate the success of one of last year’s winners – Emma Williams – who used her experience on the project to help secure a placement year with cosmetics giant L’Oreal. 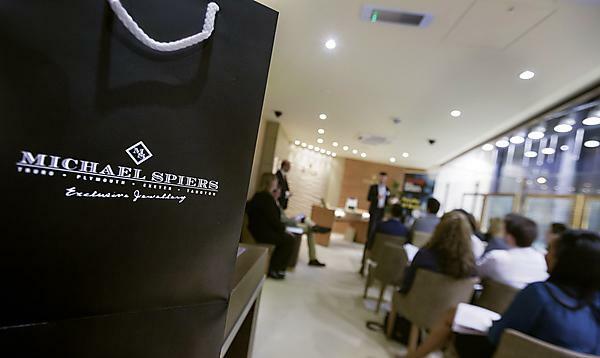 Michael Spiers Jewellers is a family-owned, award-winning business which was founded more than 60 years ago, and has locations across the South West, with showrooms in Plymouth, Truro, Exeter and Taunton. Having the opportunity to work with the talented team of students and staff at Plymouth University highlights another area of excellence for the city. The entrants represent our future customers and we take their opinions very seriously. "My fellow directors and team were very impressed with the results and have implemented many of the recommendations."